As a drummer, you must’ve felt the reflexive urge to play something unique, something unordinary. You must have felt the need to grow, to play the rhythms that are beyond the norm of what “should be”, and instead go with what “could be”. Well, that’s what a drum fill is. A drum sequence in a song (or a composition) that doesn’t quite sound like the rest. Anyhow, we’re here to discuss some easy drum fills for beginners, drum fill techniques, and those fills that sound hard. It’s hard to find a proper, positive definition of a drum fill, so we’re going to define it “negatively”. In essence, a drum fill is every drum line that’s played apart from the original drum sequences. You could even say that drum fills are improvisations, of sort. Now, there aren’t any rules as to where the drum fills should be played. It could be at the very beginning of the song, which musicians often call “drum solos”. Furthermore, you could play the fills between the verses (sometimes referred to as the “bridge” sections”. It’s not uncommon that drummers use the drum fill techniques at the very end of the song. These fills are often called “song enders”. Anyhow, we’ll discuss the drum fill types later on. It’s important for you to understand that drum fills are one of the crucial tools in your arsenal. They can be as hard as you want, or as simple as you want, it’s up to you. The truth of the matter is, a song without drum fills often appears dull and boring. Rock music is where you will find awesome drum fills. There are various rock bands that have greatly contributed to the development and improvement of this amazing technique, so you should at least check out this music stage if you’re a drummer. Basically, rockers like to keep things simple. Eighth note drum fills are most frequently used in this music genre, so let’s see what this is all about. Some of the best drum fills of all time were the “eight note drum fills”. In short, these are extremely easy techniques that are commonly used in all sorts of rock songs. Regardless of the tempo of the song, eighth note drum fills are usually slow-paced. If you want to learn how to perform this technique, you should consider this easy “drum fills for beginners – eighth note drum fills” video. In this lessons the drummer performences with an electronic drum set in which plays a main beat, and (when it’s time to perform a fill) he simply strikes different drum parts. For example, if the main beat involves the “kick-snare-ride” combination, switch to toms without changing the tempo. Jazz is one of those music genres that is very hard to define. Basically, most jazz songs were improvisations and jam sessions before transforming into an actual composition. That’s also the reason why it’s hard to discern the main theme from drum fills. Anyhow, some jazz classics like “Song for my Father” by Horace Silver are plain and straightforward. This song is slow-paced, the bass, piano, and drums play in unison, and you can easily notice the fill sections. It’s usually every fourth tact that stands out, or at least until the song picks up the pace at the middle. Now, drum fills for jazz music are different and innovative, but there are still drum fills for beginners, even in this music genre. This genre focuses primarily on drum rolls and combinations of eighth and sixteenth note drum fills. If you’re a jazz drummer looking for guidance on great drum fills, you should watch the “Jazz Drum Fill using a Paradiddle-diddle” by John X. This video explains various drum techniques, including drum rolls, drum fills, and others that will give a perfect start with the essential tools for Jazz Drumming. Funky beats and graceful tunes are the words that best describe gospel music, so we’re in for a real treat here. Basically, the drum themes of gospel music are simple, but they’re often accompanied by frequent eighth note drum fills (just like the fills in rock music). However, there are various sub-genres and variations of Gospel music (chant, praise, worship gospel, and such) that do not include any instruments whatsoever (aside from the background piano), but that’s not the topic here. An excellent example of Gospel drumming with some serious fills is this Teddy Grant perfomance. The groove and style of playing is really iconic. Metal music genre is where you will redefine your thoughts and opinions about drumming in general. Specifically speaking, the drum fill figures and sequences in this genre are so versatile that it’s nearly impossible to make a definition. First of all, Metal is the genre that features countless sub-genres which are ever expanding. From thrash metal, over black, death, and doom metal, to progressive-alternative and blackened death. Thrash metal is fast and aggressive without exception, and it’s only natural that the drum fills in thrash songs are alike. You already know Metallica, and their “Blackened” is literally full of 16s and even 32 fills. This sub-genre of metal music literally can’t be imagined without drum fills, as these parts usually serve as an introduction for savage metal solos or tempo increase. It’s hard to define power metal, as there are bands like Dragonforce that prefer sharp, fast tempos over sludgy, heavy themes (like Hamerfall, for example. Of course, there are some Power Metal bands that haven’t strayed into extremes (who even have various ballads) like Stratovarius. Let’s be clear on this – the tempo of the song doesn’t necessarily influence the frequency and tone of drum fills, but, in most cases, its influence is undeniable. Fast power metal songs are usually full of various drum fills, as can be heard in “Fury of the Storm”. Slower songs are usually focused on vocals and lyrics, and certain melancholic power metal songs (like Stratovarius – Infinity) have a low presence of drum fill technique. Death metal, in all its brutality, represents the fiercest side of metal as a music genre. The music is fast-paced, extremely aggressive, the drums are, perhaps, over-pronounced. In fact, this music genre is famous for various tempo shifts, odd time signatures, and unconventional drum sequences. In short, everything might sound like one big mess to someone who doesn’t like this sort of music, but, the truth is that everything about death metal is calculated down to the smallest detail. Good examples of metal drum fills are all over the places, including Cannibal Corpse “Hammer Smashed Face”, Dying Fetus “Shepherd’s Commandment”, and Suffocation’s “Abomination Reborn”. Drawing a line between glam metal and rock is a tough job, but it has been done anyhow. Namely, glam rock is “softer”, it sounds slightly less powerful and aggressive (even though Glam Metal doesn’t sound aggressive at all, it’s quite the opposite). While most people debate whether Guns’N’Roses and Bon Jovi are metal or rock, glam drummers want to get their hands on the drum techniques and skills used in the songs of glam giants such as these. If you are looking for good glam songs that have accentuated drum fill techniques, you should check out the House of Lords – Love Don’t Lie or Britny Fox – Girlschool. Technical metal is always accompanied by “Death, Brutal, Blackened Death” or other sub-genre term, but we’re not here to discuss genres, we’re here to discuss drum fills for beginners. Even so, we might be at a wrong place, since technical metal music isn’t exactly for beginners. Bands like Obscura, Fleshgod Apocalypse, and Cryptopsy are just some of the representatives of Technical Metal, and their stuff is everything but easy. No matter how hard you look, you won’t find any tips on beginner drum fills if you’re searching the Technical Metal section. Fleshgod Apocalypse is famous for their use of orchestra in their songs, but their drummer takes the spotlight every single time. Namely, this Italian virtuoso (Francesco Paoli) is one of the fastest living drummers, and he’s often the one that the camera guys are after during live performances. In truth, linear drum fills are hardly “beginner drum fills”, as they’re quite hard to master. Basically, these fills require you to use your brain more than your actual drumming skills. Linear drum fills are drum patterns without unison figures and overlapping strokes. As an example, let’s imagine a drum fill sequence of four strikes in 4/4. Basically, you can begin with any strike you want – a kick, snare stroke, or cymbal, but the second strike must be different from the first, the third must be different from the second, and so on. Essentially, a four-strike linear drum fill sequence could be a “kick-snare-tom-snare”, or “snare, kick, tom, kick”, and so on. Now, the reason why this drum fill technique is hard is actually quite simple. These fill techniques are often comprised of 4x4 drum figures (a full tact), but that’s not a rule, so you could shorten them if you want. If you do happen to shorten the sequence, you might find it hard to connect, as your options will be somewhat limited. Namely, if you’re playing a song that was written in 4/4 tact, you could only shorten the fill by half (2/4), or play it all the way (4/4 – full tact). Shortening it in any other way will result in “odd time signatures” which are everything but “beginner level” . The tricky part is not in the mastery of drum fills – it’s about the “how to do drum fills”. Every beginning is harder than the road itself, as you will see for yourself. First of all, you need to feel the drum fill. There’s a time and a place for everything, and this statement applies to drum fills as well. We’ve already mentioned that drum fills can be played at any point in a song, but that does not imply that it should. Some songs are groovy in nature – those songs that involve simple drum beats that are heavily focused on vocals and guitar riffs (good examples are rock songs, such as AC-DC “You shook me all night long”). The essence of “groovy” songs is the continuous beat, so excessive drum fills won’t do the trick. If that’s the case, use them right after or before a guitar solo (if there is one, that is). On the other hand, there are songs that are highly complex in nature. In fact, it’s hard to discern a drum fill from the main drum beat. A good example of a complex song would be a metal song, such as Megadeth’s “Holy Wars”. Notice that their drummer (Nick Menza) performs drum fills nearly all of the time. Now, these are the two extremes of drum fills. We have groovy songs on one side, and hard, complex songs on the other. Let’s be clear on one point – drum fills are used in virtually all music genres (even dubstep drum fills are a thing). Once you’ve grasped these extremes, you’ll find the answer to “when to use drum fills” in the golden middle. As long as you stick with the basic guidelines, you’ll be okay. In summary, you need to feel the moment and avoid overdoing it. Drum fills are the core of a song, not the theme itself. Without drum fills, any song will appear dull after a while. 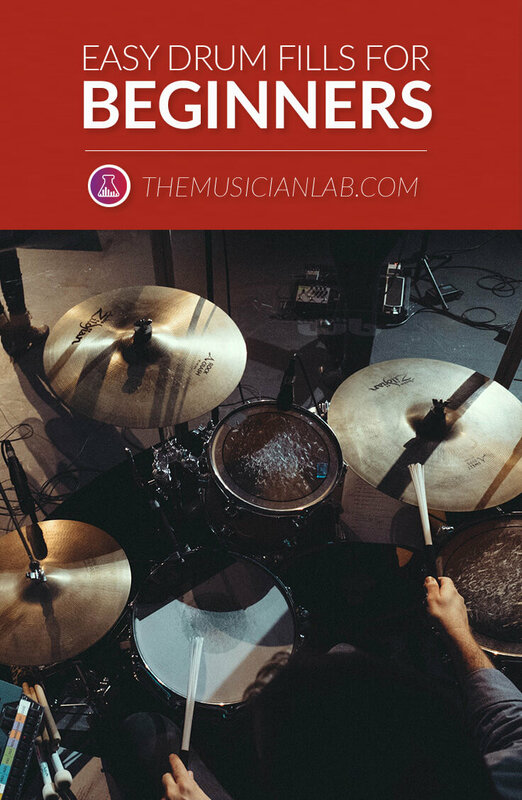 This is the reason why we’ve added so many examples of various music genres, as the key to mastering drum fills lie in versatility. As a beginner, you should create your own style, that’s only normal, but you should also broaden your hearing sense in terms of opening up to different styles. Every drummer uses different drum fill techniques, and it’s up to you to discover the approach that suits you the best. If you enjoyed this article please help us spread the word.